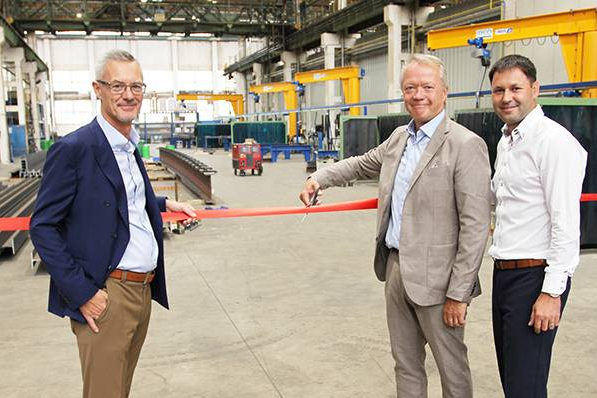 Pontus Kallén, acting CEO of Astron Buildings, cut the ribbon of the new production line, together with Gordon Pringle, Director of the Přerov site, and Vaclav Šíma, Plant Manager. The new investment allows Astron to increase the capacity of multi-storey building production. Brand new machines from European leader Voortman process raw materials with great speed and precision. Using STRUMIS as the new software engineering program, we are able perform cutting and drilling with significant time saving. As a result, we are now able to produce multi-storey buildings faster and in very high quality. For additional tasks, new welding machines and cranes have been bought, as well as a bending press. A second bending press will be installed later this year. The new equipment will mainly serve to fulfill the increasing demand for Multi-storey Car Parks across the whole of Europe. For more information on Astron Buildings S.A. visit their website.